Social media is an important part of any brand strategy. There are so many networks nowadays, and all of them are utilized by millions of people worldwide. ModernMarca can set up and manage your accounts on all social platforms, including Facebook, Instagram, Linkedin, Twitter and more, ensuring that you get your word out to your target audience. We will also routinely post on your behalf from all your social accounts, ensuring that your online followers hear from their favorite brand. We can offer regular postings that fit your needs on the social networks that will best fit your business. All of our posts will be approved by you, and then scheduled to meet your needs. Facebook is the largest social networking website in the world, boasting over 2.27 billion active users and counting. ModernMarca helps you harness the audience on Facebook by direct Facebook advertising or by non-advertising methods (social media marketing and content marketing). Twitter is a free social networking microblogging service that allows users to broadcast short posts called tweets. Tweets can include hyperlinks and are limited in character. Tap into Twitter with ModernMarca’s expert social media content schedule and strategic advertising to build an active, engaged Twitter following. Instagram is a free, online photo-sharing applications and social network platform that was acquired by Facebook in 2012. Instagram is a great way to connect with a large, engaged audience by editing and uploading photos and short videos through a mobile app. 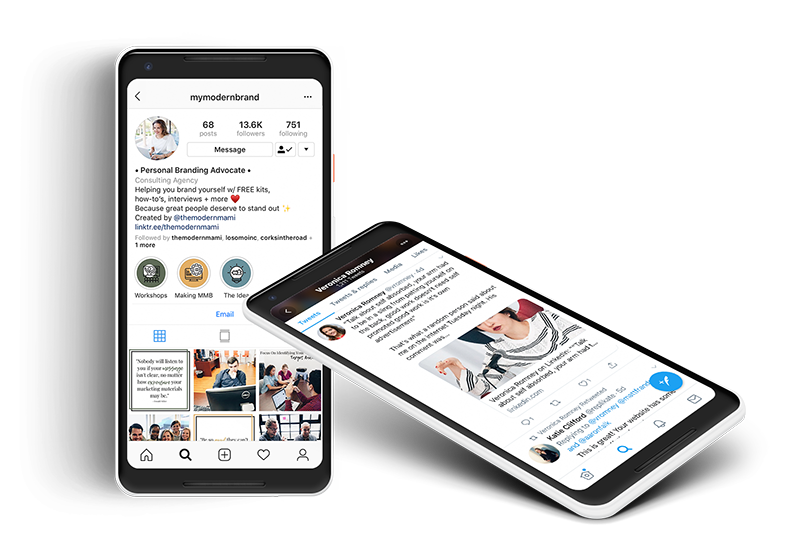 ModernMarca creates a style guide for Instagram and develops consistent, on-brand posts that make it easy to tap into this network and connect with your ideal customer or client. LinkedIn is a popular social networking site designed specifically for the business community. The goal of LinkedIn is to allow registered members to build and connect with networks of people that they know and trust professionally. LinkedIn also offers groups, business pages and social media advertising options. This can be an essential part of a marketing strategy, depending on your brand’s niche, that ModernMarca can research and implement.